Birthdays are very special events. Days that we look forward to sharing and with our closest friends and family. That very first Birthday is particularly special. We had started talking about our little ones first birthday last year already, way before the event. Still, it was pretty complicated to get our heads around, especially since none of us has any family close to Stockholm. I guess it’s the same for many expats with kids, a little complicated. Oh – it’s in the middle of the week. Just to add to the complication. So, those closest to us, those people who really want to celebrate our little one on her special day, are not close by. We live in Stockholm. Neither of us are from here and have no family around the corner. Our family is half Swedish, but even that family is not from this part of Sweden. The other half, my English side are not exactly next door. Maybe not even in the EU soon enough – but that’s another story altogether. So how do you plan a birthday? Especially when, nobody from our closest people live close by. The questions started to pop up: Do we invite everyone at the same time to have one big celebration at our place? Hoping of course that everyone organises their own accommodation and that we don’t invite someone and leave another out. And that they can make it on a Wednesday…Or, do we have several small celebrations with different groups? Separate events at different times inviting different loved ones? Do we move the celebrations to the weekend and hope it’s easier for people to come then? (Something my partner was very resilient to – “birthdays should be celebrated on the actual day!”)Or do we do something with just us, her parents? Keeping it small, manageable and say sod it to the rest of the family because it’s too stressful to organise. We wondered long and hard about this and finally settled for several small events, where everyone was welcome to join when they could. The actual day was still however, slightly complicated due to it being on a Wednesday. Nonetheless, we had a window of catching a few friends after work and before our little one’s bedtime, to mark the special day. We through some names together of our friends, with whom the little one was familiar with. We knew there would be some last minute dropouts, but still managed to over buy the amount of Prosecco bottles. They’ll be handy some other time, I’m sure. The cake was ordered in advance, it was a fancy one indeed (Thank you, NK!) 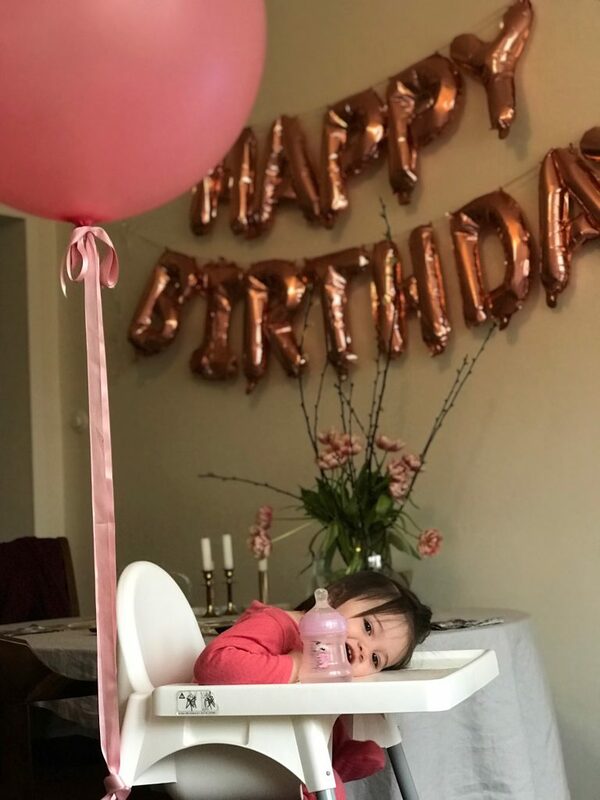 A couple of balloons, which the birthday girl loved, a nice tablecloth, some birthday décor – and we were all set. The guests arrived and we had appetizers, bubbles and cake and of course cheered to the little one. While she played with her gifts and looked confused as to why the people were there. A quick celebration of one and half hours before, Zzzz, she had to go to bed. First part of the birthday was done and just two more parts to go. She was happy with her first birthday, sans relatives. Event number two was my parents’ visit. It happened a few days after the short but sweet birthday party. That’s often why it’s complicated also with overseas relatives coming for a celebration; it’s not just a couple of hours after work – they are here for days at a time. That can be quite exhausting, and for us, despite our birthday party being the smaller kind, we were already feeling exhausted. Anyway they were here for the little one and she thought it was fun. Gifts galore, they had filled their entire bag with surprises. 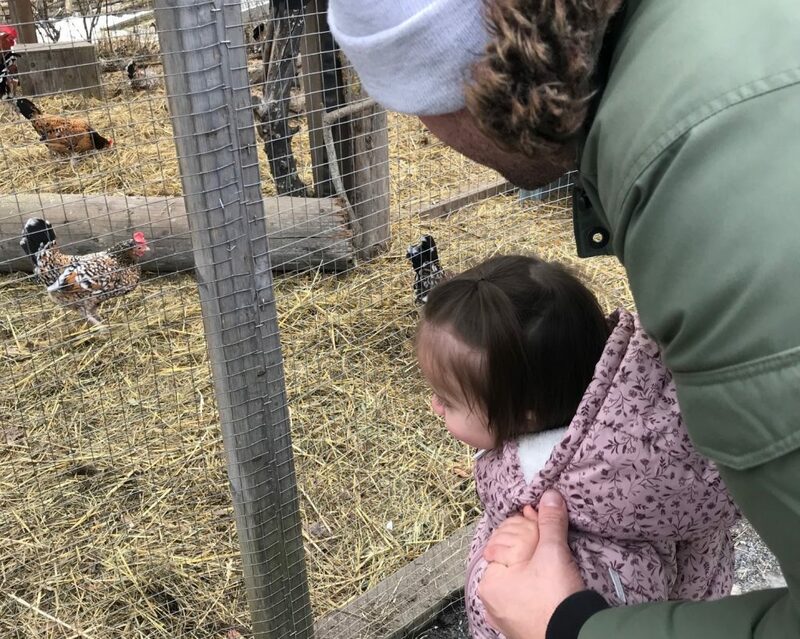 It was lunch out on the Saturday down in Winterviken, followed by a trip to the 4H (local farm) to point and laugh at animals. A walk around Djurgarden on the Sunday, followed by lunch at Rosendahls. All this with nonstop peekaboo games from granddad. No, (well a little) and now it’s time to see the Swedish side of family. The final leg of our Birthday bonanza. Beginning with a long train ride. The little one trying her best to crawl under the seats and down the isle, she was wild and determined to have loads of fun. Not as fun for our fellow passengers, I’m afraid. Luckily we were in SJ’s family section, which by the way is a great tip for you to check out. Eventually she slept in her seat, so we grabbed dinner and a glass of wine from the SJ bistro. The next day a few family members gathered for lunchtime dinner and we celebrated the little one again. Spoilt again, she loved it; gifts and clothes, all the attention. Totally worth it, of course, but us parents were a little tired. It was however, another successful part of two-week-long birthday. 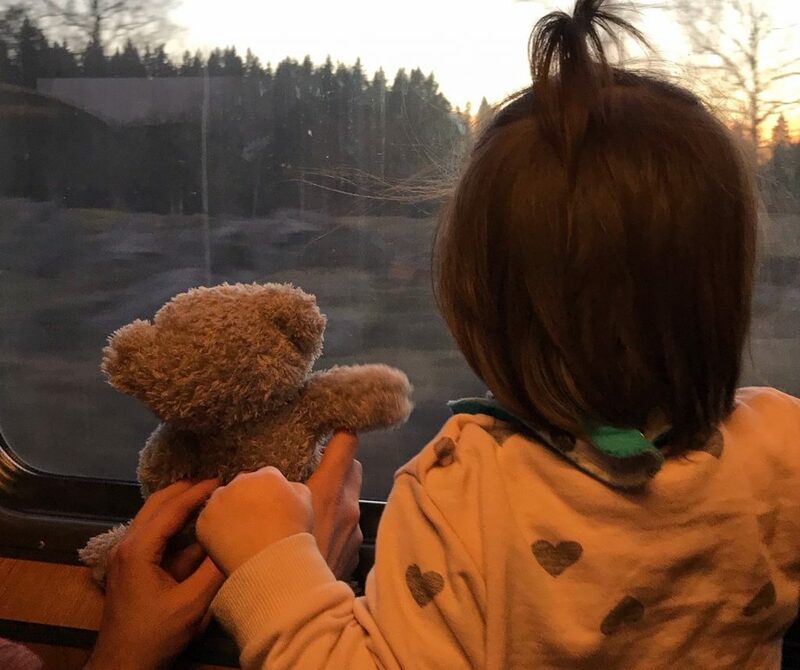 After this adventure my thoughts on coming birthdays, and the tip I can share with you Littlebearabroad readers: always have a clear plan of what you’re going to do and who it will involve. Maybe not inviting too many people, because the little one doesn’t know or understand really what is going on, so you are just adding stress to your own life. And most importantly, have fun and enjoy these moments; don’t get stuck entertaining guests – it’s all about the little person at the centre of the celebration. After all, you only turn one once.